Public relations demands that an officer plans, develops and implements all PR strategies through liaising with their associates and major spokespersons. Hence, they prepare and organize the creation of publicity handouts, brochures, promotional clips and mail leaflets among other things. They also update data on an organization’s social media accounts even as they commission market research. You may like Social Worker Job Description Templates. 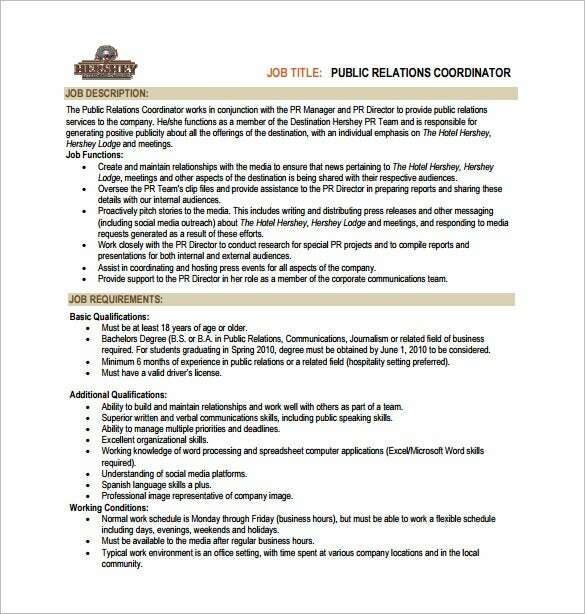 In addition, PR officers represent their institutions before the media, their clients and other institutions. Therefore, they have to research, write and distribute press releases appropriately even as they collate and analyze media coverage. 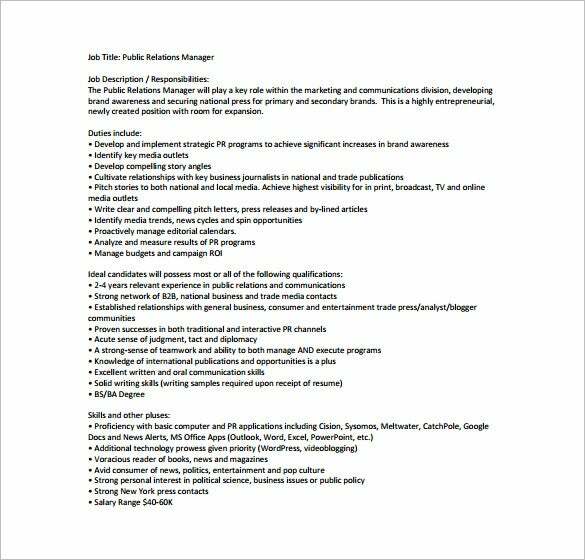 They also document and edit in-house speeches, articles, annual reports and magazines.You may also like Job Description Templates. 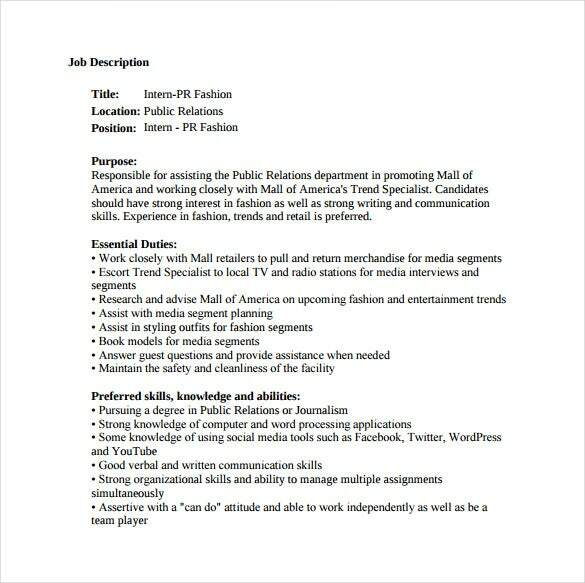 mallofamerica.com | Fashion Public Relation Job Description Sample Template can be the best template for developing job opportunity posts that are primarily responsible for providing assistance to the Public Relations department and can be excellent promotional tool for the purpose. The fonts are simple and easy to understand. They can be customized as per the requirement. 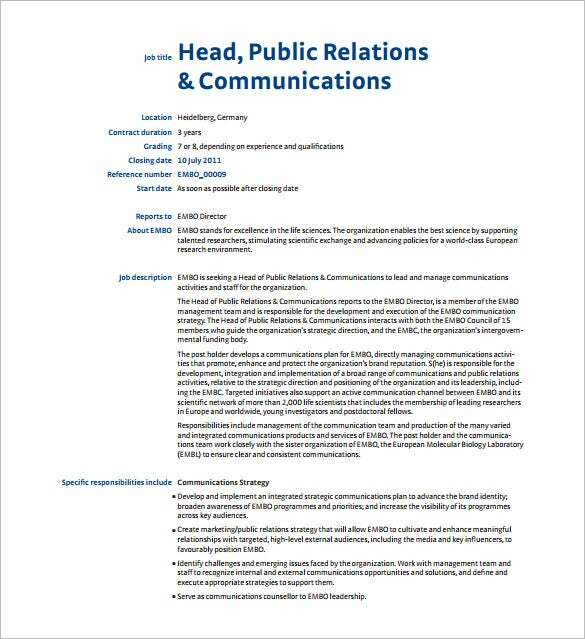 my.usj.edu | Public Relation Intern Sample Job Description Template is free to download and can be easily customized. 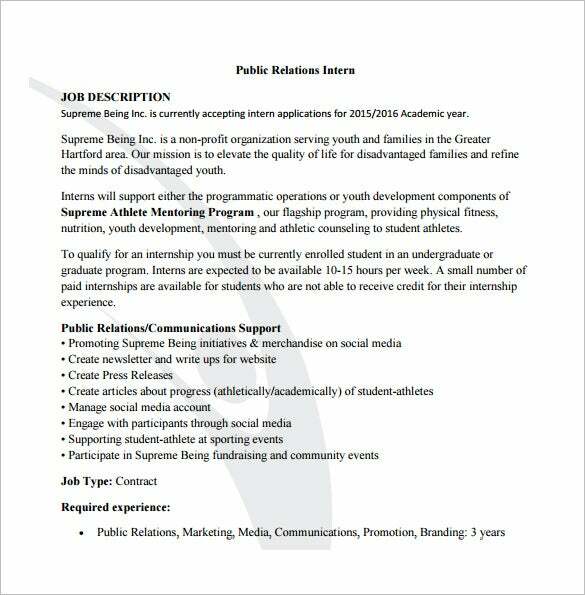 It is available in PDF format and feature all the necessary information required for an intern job template related to public relations. The template is printer friendly and the layout output can be in A4 and A3 size format as well letter-head format. 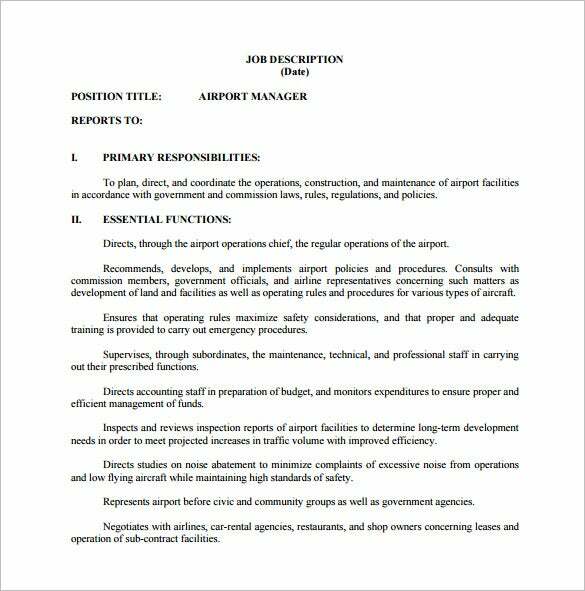 hrxperts.org | If you are planning to apply for public relations job in the aviation industry as an Airport Manager, this template would definitely serve your purpose. The template is well formatted with perfect sections and formatting to make your task easier. It is printer friendly and can be downloaded for free in PDF format. embl.de | Are you trying to create job descriptions for senior managerial posts in Public Relations Sector? If so, download this template for free. It can be the best option for anyone and everyone who want to create job opportunities through formal and detailed write-ups. The template can be downloaded in both .DOC and .PDF format. 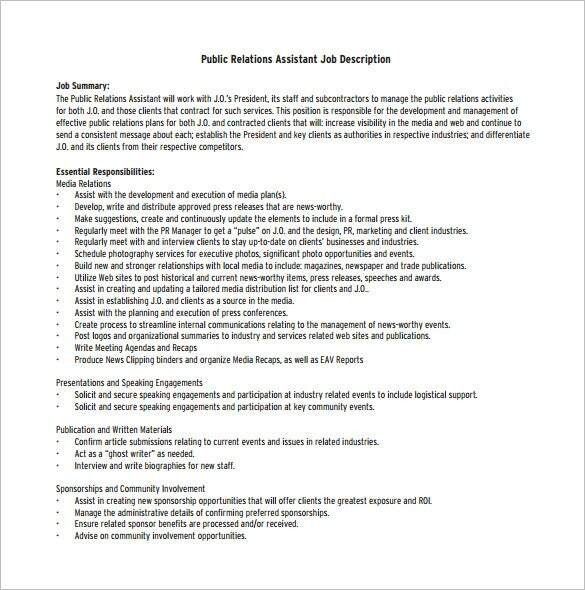 A perfectly formatted public relations job description template that’s free to download will definitely save on a whole lot of effort and time on the drafting part. There will be fixed formats available in the template. The template sample will provide an overview of the content and would give any sort of idea about formatting. This type of a sample will definitely prove to be highly helpful for all those who want to create job description and vacancy opportunities through written documentation. Having a nice sample will prevent you from committing errors while forming the document. It saves time and makes the documentation creation part look easy and well crafted. 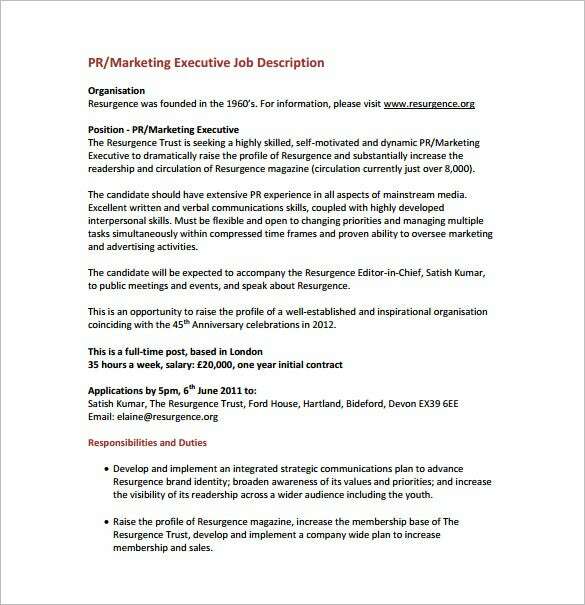 A niche and clear sample of public relations job descriptions template can help you to get out of stress. If you are the owner of a company, this type of a letter template would ensure that all the demands and requirements for the jobs are clearly documented which in turn will definitely benefit in figuring out the right type of candidates. This type of templates will cater largely to the corporates, be it big scale, mid-scale or small scale industry. It is also necessary to ensure that the form is downloaded in the correct format. These templates are free to download in PDF format. These templates are perfect for drafting or documentation purpose. Using these templates would definitely help in savingbig amount of time while carrying out the documentation. The template sample will provide an overview of the content and would give any sort of idea about formatting. This type of a sample will definitely prove to be highly helpful for all those who want to create job description and vacancy opportunities through written documentation. Having a nice sample will prevent you from committing errors while forming the document. It saves time and makes the documentation creation part look easy and well crafted. 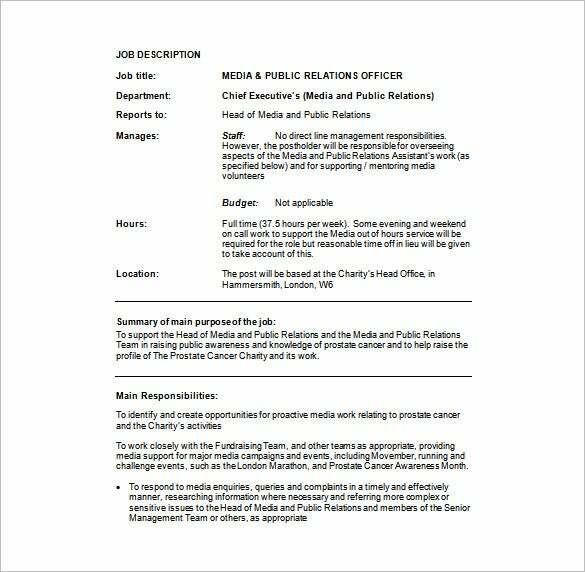 Having a good public relations job description template will ensure hassle free drafting process for the job posting part. It will save a lot on effort, time, and resources required to develop an entirely new draft from the scratch. Use these templates to have basic understanding of the contents, structure, and document process.